Ah Easter! A day where we celebrate the pending arrival of spring with milk-chocolate eggs, milk-chocolate bunnies, and baskets filled with fake green grass that ends up everywhere. We also have our own spiritual reasons for celebrating the spring. 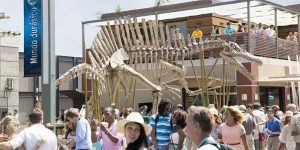 The spring indicates the arrival of warm weather here in the northern hemisphere and one thing that is synonymous with the warm weather summer months when the Jurassic films have graced the silver screens. The entire month of June, as a result, has been dedicated as Jurassic June (also a site with details on how to have a dino-mite June) as well to usher in the warm weather and plethora of dinosaur movies that have been brought into existence. The Official Jurassic World Facebook page had an interesting tidbit of offering “Easter Eggs” for digestion among the peeps and chocolate rabbits to grace our baskets this morning. So wait? The official social media for the film franchise is saying that Spinosaurus in the fourth film that looks anatomically different from the actual Spinosaurus seen in the third film (as well as what’s known to modern paleontology at present) is the SAME ONE from the third film? Well that’s…highly unlikely? How in the world is that possible? Many questions ran through our minds about this morsel of information to pop up on our screens today. It’s no secret the fandom has a lot of fluffy unsupported notions that end up in the many fan attempts at the various encyclopedia due to the vaguity from NBC Universal itself. Fans don’t like to have an unknown in any thing, much like people. Unfortunately that makes the attempts less than objective as they float about. Our mission here is embracing that unknown and dismissal of that fluff with what it actually is instead of the notion of what many think and want it to be in the end. I’ll skip the restatement of our mission statement, but if you read the introduction on our main landing page of the site you’ll see what our aims are as well as if one spent time looking at our research protocol we have available as an effort of showcasing transparency. So we embrace the notion of Universal dictating the canon and even throwing them a bone when there is no direct exposition (meta or otherwise) to indicate changes in the dinosaur designs from first and second films to the third and fourth films given the subject of genetic manipulation adapted from the source material and the fact it is often “shown” instead of “told” by various background props and subtle lines of certain comments from certain characters that would have knowledge about the process fundamentally or deeply like Peter Ludlow in the second film indicating the dinosaurs were software to Henry Wu‘s comments in the fourth film about nothing being natural in Jurassic World and them not using the entire genome of the dinosaurs. 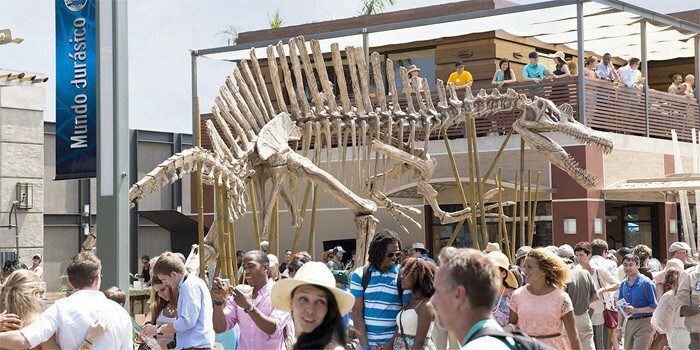 It is true that Jurassic World director, Colin Trevorrow, did make an offhand comment about the skeleton being that of the Spinosaurus from the third film in many a film interviews, but it was clearly something in jest about the subject or so we thought up until this point. Let’s go back to 2001 here for a moment and discuss why the Spinosaurus is getting this send-off like it is and gain some perspective here. Steven Spielberg had left his mark with the ending of The Lost World: Jurassic Park and decided against returning to do a third film due to making other projects at the same time. So JP3 was announced with Joe Johnston helming as director of this particular film. There were a lot of issues with JP/// in terms of script problems at first with it needing to be redone entirely while in the middle of the production to even changed Logosaurs from the staple of the Tyrannosaurus, from the much wanted Baryonyx to the Spinosaurus that appeared as the end result. The film even lampoons the fandom at the discussion of the logosaur with what dinosaur attacked the plane between Billy Brennan and fan favorite, Dr. Alan Grant. JP/// tried to do something new and probably heretical, it was going to dethrone the tyrant lizard king and instill the Spinosaurus as the alpha super predator of the third film. As you can imagine people reacted poorly to this the point there are many that hope for a rematch of the two and continue on in “fanboy” like comments of one being superior over the other. It can get a bit problematic and also really annoying for those of us who have gotten over the fight and let it go altogether. 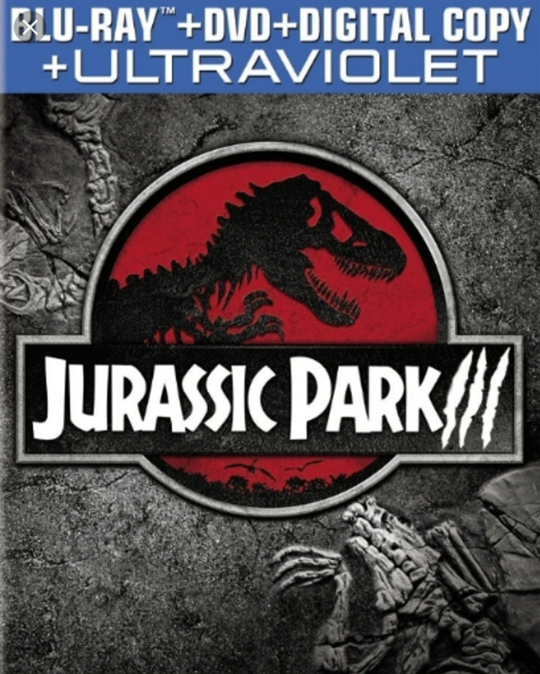 So, given the negative reaction Jurassic Park 3 garnered with the fandom and the general public it would see all indications of sending the Tyrannosaurus away as an ill-conceived notion that unceremoniously killed off one of the most popular dinosaurs in the world to put this “pretender to the throne” as so many have felt about the Spinosaurus. Sadly, due to Jurassic Park 3’s negative reaction from the fans and the subsequent push for hybrids via the abandoned John Sayles script that created the dreaded human-dinosaur hybrids that will become known as “Homocraptors” by the fandom it seemed the Spinosaurus was blamed primarily for the unsuccess of the film. Let’s be honest here on JP/// though: It wasn’t so much the Spinosaurus as it was the simplistic story created for it. While the “new” Velociraptors were cool the intelligence factor was beyond anything seen in the films previously. The new Raptors and other new designs for animals could have done with a healthy portion of exposition to indicate the differences especially for a character like Grant that would be seeing some of these animals for the first time. The great thing about the second film is that it didn’t really need to explain the differences as the heavy comments from the production at the time were indicating we were getting touched up female designs from the first film while also getting newly created male designs for the second film. It was self-explanatory whereas JP/// wasn’t and leads one to go hunting and looking in the background. Unfortunately with JP/// and the lack of positive response for the film altogether resulted in Universal taking it upon themselves to phase a symptom of it out of the logo altogether. The Spinosaurus, while being partly responsible for the distaste for the third film, mostly due to how it was portrayed as what some fans have called a “Homicidal Mutant Duck of Death” was basically unceremoniously given a send off like it killed the Tyrannosaurus in the third film. 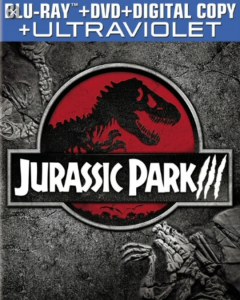 This can be seen in many of the recent cover re-releases for the third film for home video and digital. Does the Spinosaurus deserve this though? As said it was merely a symptom of the misguided direction the film took. The film itself was like a Diet-Jurassic Park itself too, but the blame was basically bad decisions on continuing with the production without perfecting the script and going for what was cool instead of adhering stricter to the continuity. It really isn’t one specific person’s or even dinosaur’s, in this case, fault. It made a decent amount and still is an overall decent popcorn summer flick in the end, but it is a massive departure from the source material and even the first two films in the series and that’s why it wasn’t a success. It was more watered down due to the simplicity of the plot from the first two films. Little science involved here and some of the stuff was more on the line of an amateur fan-fiction. I personally believe the return of the Velociraptor eggs near the end of the film is possibly one of the worst moments in the franchise thus far beyond anything that I would gripe or complain about from the first two films. Jurassic World Spinosaurus showing more the length. Note how small it is. So Universal seems very concerned with sending the Spinosaurus off as it blames it for the negative reaction to the third film. That said, Universal really seems to be really pushing this idea as well of the skeleton, being from that particular animal itself even though Trevorrow’s interview where he suggested it sound like the comment was made in jest more than anything. One dubious note we have from the Masrani-Global Viral Site’s Backdoor is that Hoskins “faced down a 7-ton animal and was impressed” by it along with the Spinosaurus being as “the monstrous thing on Site B” but nothing beyond that. Mulling over the facts here we can realize the Spinosaurus skeleton seen in the film is drastically anatomically different from the animal we got in the third installment. I went ahead and included the publicized screenshot from the Dinosaur Chart created for JP/// by the special effects crew at ILM. 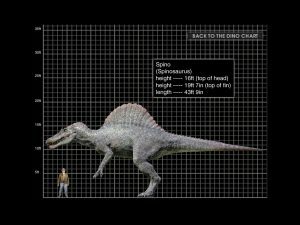 The size of the Spinosaurus in the third film is 19 feet at the top of the sail and 16 feet at the top of the head in terms of height while being 43 feet and 9 inches in terms of length. That said this shows the figure is significantly bigger than the above skeleton pictured in the previous paragraph. In fact when it comes to the sails they’re not even the same height and that’s a big one right away! So we’re kind of left with quite the discrepancy here all because someone took a comment made in jest to be something serious and ran with it to pulse out to social media. We can thankfully show that discrepancy here in this analysis to share with you, the reader. At least that’s what we’re going with here until more information is available to us. Among the other differences besides the length, there’s also the fact that anatomically very different animals. The Spinosaurus seen in Jurassic Park /// is based on early 21st century information that paleontologists understood about the animal then. One of the best skeletons of Spinosaurus ever dug up was lost when Allied forces carpet bombed Berlin back in World War II, that skeleton being turned to dust in the process. Because of this, paleontologists had very little information on the anatomy of the animal. Up until the late 20th century, paleontologists still believed the animal had an Allosaurine skull, which was present even on the The Lost World toy line animal. 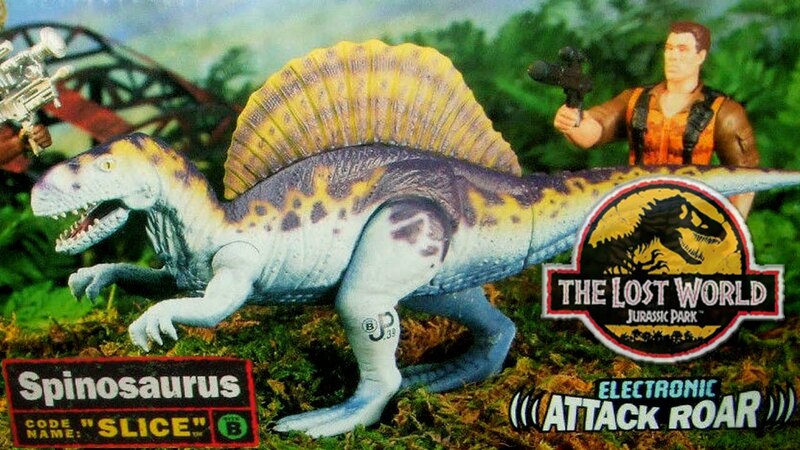 Jurassic Park /// was actually one of the first time a long snouted Spinosaurus ever went mainstream. However, because it was so early in what would eventually become a revolution in the way we saw the animal, which spanned a series of a decade and a half, the Spinosaurus seen in Jurassic Park /// would soon become inaccurate, and effectively, its own animal. Designed as the robust, terrestrial predator paleontologists thought it as in the early 2000s, we find something with powerful limbs, a thick neck, and paws capable of decapitating a T. rex! However, the real thing was very different, and this changing view of Spinosaurus reflected that. Instead of a short, arched sail, it became of long, vertebral column that nearly spanned the length of the animal itself. Instead of hands like a boxing glove, they became hooked fishing lines. Instead of two crests over the eyes, it became one tiny sail on the forehead. Instead of thick, gnashing jaws, the mouth became a graceful pelican like fishnet. All of these built for an animal that spent its life in the water. And the skeleton in Jurassic World reflects that build. And even then, the skeleton was already inaccurate before the movie was even out. 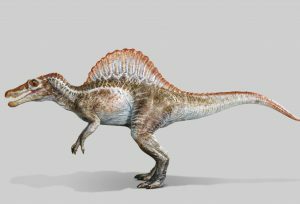 Science marches on and new discoveries showed that Spinosaurus had short legs relative to its body size, legs so short it could barely be bipedal and probably was often quadrupedal when it wasn’t spending its time hunting for huge fish in Cretaceous swamps. 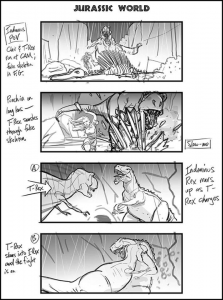 Jurassic World Storyboard indicating the Spinosaurus skeleton is a fake skeleton (That said, of course it would be production wise, but we’re taking this means so in the actual context of the story as well and thus throws the easter egg into conflict because we don’t fully know). The Jurassic Park /// Spinosaurus was a robust animal, and so different from its real life counterpart that we fans gave it a special designation simply to differentiate which animal we were referring to. Despite not having the build for it, the Jurassic Park /// Spinosaurus still maintained a semi-aquatic lifestyle, and was capable of capsizing a small barge in a vicious attack on Dr. Alan Grant and his companions when they were sailing down an Isla Sorna river. And that’s a key word right there: Isla Sorna. How does a Spinosaurus living on Isla Sorna end up on an island 87 miles away? Some have suggested that InGen pillaged its skeleton from the island, and brought it to Isla Nublar. Others have suggested that it washed ashore in Costa Rica as some aberrant form. However it ended up there, an animal built for a mainly terrestrial lifestyle was definitely not swimming to Isla Nublar. That said, we may not agree with it ourselves, but we will embrace it and put it on the page even if it isn’t feasible or was a joke to begin with. There’s a but though, one of our editors (Aegyptiacus3, welcome him!) 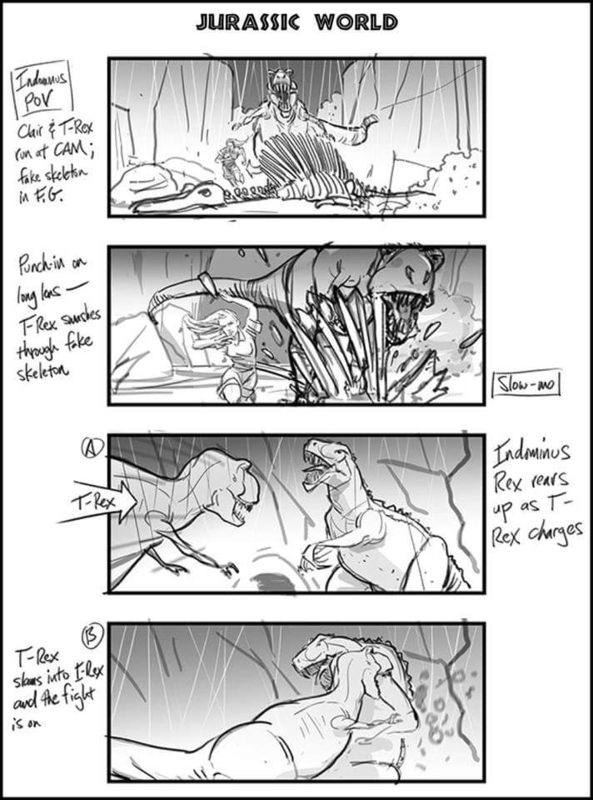 found the storyboards created for Jurassic World for filming. It states the actual skeleton is a fake! So there’s apparently a disconnect here between what Universal is pushing out on social media and what is going on behind the scenes. Inconsistencies abound in this franchise and frankly they are apart of life as well, but this feels like a grievous oversight. As this is an opinion piece from us I have turned on commenting for the sake of discussion of course that wish to join in on the conversation or have something constructive to say regarding this article. We’re just a bunch of humans with way too much time on our hands here if this points to that fact more clearly here. If you excuse me, I have some chocolate bunnies to consume and marshmallow peeps to awkwardly voice pleas of help from as they enter my digestive tract.